Practitioners of Muslim Kung Fu have overcome persecution and constant reprisal to carve an important niche in modern day history. China is a dish spiced by many cultures. There are over 50 minorities among the Chinese besides the Han people themselves. A significant number, over five million of these, are Muslims – known in Chinese as the “Hui” people. In the tenth century large numbers of Persians and Arabs extended the Muslim trade routes deep into China. Many settled and widely dispersed through the country; some living among the general population, some sticking close to concentrated communities of believers. If there is one universally recognized set for the Muslim style it is the “springing leg” or Tan Tui. At first blush Tan Tui seems callously unimpressive. The moves are repetitious, stretched out, almost mechanical and performed up and back as though on a track; each segment is termed a “road.” The original style was subdivided into ten such roads. Later, a southern version was introduced that split some of the harder roads into more digestible bites and expanded the set to 12 roads. To this day, if you say you practice Tan Tui, those in the know will immediately ask “10 or 12?” Tan Tui is a popular set adopted by many styles and lent a special flavor by each. For instance, in one branch of mantis, there is a 14-road Tan Tui. With such popularity Tan Tui became one of the first universal kung-fu sets and therefore can claim a part as forerunner of contemporary wushu’s standardized forms. Tan Tui, as we have said, is not a flashy looking set. Mostly straight punches and kicks, it seems to some to possess a robotic aspect that makes it look more like work than fun. But tan Tui is so profound that many boxers throughout history have specialized in its technique. For instance, the wide-open punches of Tan Tui, known as yoke punches, are designed along the lines of Chinese medical practice to stretch and invigorate the meridians of the body. Simultaneously, the yoke punch, with its exaggerated arm extension, is a perfect indicator of the placement of the student’s waist. Shoulders, which normally fly upward in the beginning student, are so stretched they naturally drop and relax. The same benefits go for the extended long leg kicks of the art. As the name suggests Tan Tui attempts to strengthen the abdominal muscles of the practitioner by forcing him to extend while kicking. The striking leg must immediately elevate from the ground with minimal cocking action. Wrapping “Bao” not only blocks but controls the opponent’s ability to continue attacking. 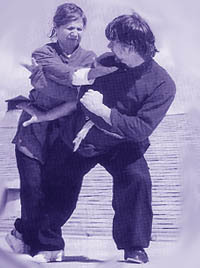 In true northern kung-fu long fist fashion, Tan Tui encourages the student to find his maximum range of motion before tightening and shortening up. Tan Tui disallows the beginner’s tendency of bent limbs and tensed muscles to create power. It lives up to its name of long fist by making the student think in a new way, in a sense reprogramming his ideas of power generation and range of motion. In due course, after the student has learned the ten basic roads the real training should begin. This is a good example of ancient training methods versus more contemporary ones. Nowadays, having completed the tan Tui, the student immediately moves onto another more interesting and diverse set of actions. This is too bad because the training has really just begun. For instance, since the ten roads are each separate they can be done in any order. A good Tan Tui instructor will then have the student mix and match roads until any road can be done in any order at will. Then the roads are again practiced with shuffling steps, changes of speed, and angled steps breaking the robot-like aspect completely. This challenges the students’ creativity and ability to respond. Finally the actions from the roads are completely mixed so the student may start with No. 1, switch to No. 8, and finish with No. 5 without losing place or direction. 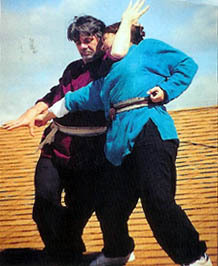 From a simple series of movements the student is now only a small step from basic sparring practice. 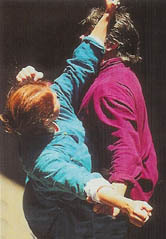 The “yoke punch” of the famous Spring Leg, (Tan Tui) form. Tan Tui is said to have been created in the Ming dynasty by ChaShagmir (a distinctly Muslim name even in Chinese). Chamir, as he was called, was among those who went to the coast to protect the shores of China against raids by Japanese pirates. However, on this long journey he became sick from the harsh weather conditions. He was left to recuperate in a mountain village in GuanXian County. His hosts in this small village were so kind to him that when he recovered that autumn and watched them practice their kung-fu after harvest he decided to teach them the art he had devised. They were grateful and his art spread far and wide from this origin. People took the first syllable of his name “Cha” and thus the style known as “Cha Chuan” – Cha Fist, was born. Originally its basis, the Tan Tui set, was composed of 28 routines – one for each letter of the Arabic alphabet. Eventually everything was compiled into the ten road spring leg which remains with us today. Those familiar with Arabic religious poetry will note that many root words in Arabic are without vowels and can be rearranged to create other meanings and levels of understanding. This rearrangement, also familiar to certain Christian and Jewish sects, was considered a valid study for all students of the Bible, Torah and Koran. And note as an interesting sidelight that this is precisely the method of teaching for the Tan Tui, taking ten routes (roots) and reassembling them to form new meanings and combinations still related to the original exercises. The yoke punch in action. There is an old saying in kung-fu that one form mastered is worth a hundred tasted. But too often people take this to indicate a mindless repetition of the form. Tan Tui is a perfect example of what form mastery is meant to entail. Rather than learning flashier new forms which ultimately reduce to the same moves in new combinations with a little “Hollywood” thrown in, the traditional student of kung-fu developed power and stability with familiar movements before gradually altering them to new situations. He reinvested and compounded his knowledge. It was a wise way to save and to practice. As it progressed Cha style and other Muslim boxing methods became known under the general name of Jiao Men (sect fighting). Of the many jiao men forms one group in particular, the ten sets of Cha Chuan, is famous. Like the ten core sets of Shaolin, these famous forms encompass the entire repertoire of the Cha style, not counting weapons. The first one taught is generally Cha No. 4, a famous long fist form. Cha is a particularly beautiful style. Like any northern long fist it is big, proud and fluid. Stances are lower than in most Shaolin-type styles with special emphasis on height changes, waist turning and hip control. But it is Cha Fist’s special emphasis on timing which is particularly interesting. Most beginning kung-fu practitioners sweat buckets just to coordinate hands and legs as a single unit. 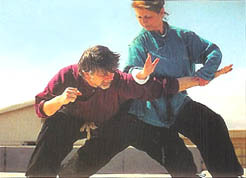 But as the Cha student progresses this simplified coordination step and punch, kick and palm slowly disappears. It is replaced by a subtle offset rhythm speeds from each other and from the legs. 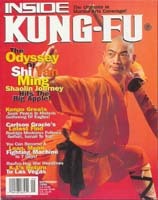 “Splitting” or twisting the body in two directions at once, emphasizes the bi-directional quality of true Kung Fu. Cha Fist excels in broken rhythm, offset rhythm and all sorts of movements that seem to set up a timing, violate it and dovetail right back into the proper beat, converging at just the right moment. “Convergence” is the key word here. As in all advanced kung-fu the practitioner is looking for limbs to travel at different rates and then converge just at the moment of completion. Seen in this light all those different moves and stances in kung-fu forms are more than just beautiful postures. Each group is actually an entirely different task requiring different coordination and convergence. Cha fist maintains the ancient and subtle variations in timing, pace and execution that make for distinctive, not cookie-cutter, kung-fu. On the stage of world history the Muslim world has been an important player, especially in relations with the East. The followers of Islam were the first to bridge the gap between Chinese and Western medicine and they started that 1,000 years ago. Alchemy, beginning in China, was transported directly through the Arab world to the West and rooted itself as the beginnings of modern chemistry. Cannon fist not only strikes but utilizes grappling attacks. The Muslim fist in China has also made worthy contributions. When the newly formed Republic of China began its creation of a generic, contemporary version of Wushu it looked to Jiao Men as its basis. The reasoning was interesting. Muslims, as a whole, had always been isolated within the minorities of China and therefore had far less traffic with other groups. It was thought, therefore by the powers that be, that Muslim fist must be essentially more “pure” than many other style. 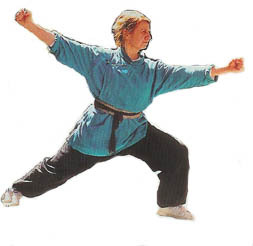 It was adopted as the basis of contemporary long fist and many of the first long fist sets issued by the government office were based on Cha Chuan. So universally recognized was Pa Chi as one of the most no-nonsense styles that even in our present era it was considered without equal. Witness the fact that a famous Pa Chi teacher was the instructor of Chiang Kai Shek’s, Mao Tse Tung’s and Sun Yet Sen’s bodyguards. That’s right the men who protected these three sworn enemies were all kung-fu brothers. Line #4 of Tan Tui emphasizing twisting and crossing. Note the scissors stance leglock. In modern times we are constantly assailed with representations of Arab culture as seemingly comprised of religious fanatics and terrorists. Martial arts training is a nice antidote for cultural ignorance. We are allowed through it to replicate the actions practiced by different people from different cultures who lived centuries from us. We cannot only improve our health and our skills but don another person’s shoes and walk down his path, or in the case of Tan Tui, ten roads. Posted August 4, 2017 by Ted Mancuso. Comments and trackbacks are open. Follow the comments feed. Tagged with: Adam Hsu, Baji Quan, Cha Chuan, Cha Quan, Dai Xin Yi, Hui Min, Jiao Men, Ki Zi Ming, ku yu cheong, Liu Yun Chiao, Pa Chi Chuan, Pigua Zhang, Tan Tui, Xin Yi, Xing Yi, Zha Quan. This captures a thought I have been rolling around in my head for weeks. It answers the Tradition part of the question of Why Do I Practice Martial Arts? Do you mind if I use it? I will, of course, quote and credit you. Thank you and, yes, please go ahead and use it with attribution. What a fine piece of writing. Informative with a much needed observation about Kung Fu brotherhood. Surely it will help some of your readers to reconsider their relationship with Muslims, and bring some understanding. Humility seems to prevent you from mentioning that you offer a free video for learning tantui on your site. A well done video worth pursuing. I have seen hints of two person tan tui in my studies. I wonder if there is such A video tucked away in your forms area, I will have to take a look. What a beautiful article explaining a cultural jewel of both China, and the Islamic world! Now, I don’t suppose I could tempt the Plum team to consider their next book cover the Tan Tui set? What an excellent take that would create on this essential style! – in comparison, the other Muslim ethnic groups which are culturally non-Chinese (Uygurs, Salars, Kirghiz, etc.) never developed such kind of fighting styles. – The martial arts developed by Hui people were sooner or later also taught to non-Hui, and when practiced by non-Hui, they were practiced exactly the same way. Some Han practitioners even sometime surpassed Hui ones in terms of fame in their own style. Last but not least, until the artificial creation of the �Hui Minority� status, the Hui people never were a united nation. The Hui people were living as dispersed groups through the whole Chinese territory, with diverse cultural and Islamic practices (Gedimu, Sufi brotherhoods, etc.). A detailed analysis of the violent conflicts in which the Hui were involved show that they rarely had any religious origin, but were rather local revolts motivated by political or economical factors (corruption of local officials, family feuds, etc.). The revolting Hui never had the objectives to defend or expand their religion, nor did they had any secessionist ambition. In many cases they allied with non-muslims groups in order to fight non-Muslim or Muslim enemies. Finally, when the conflicts had religious origins, they were due to conflicts among the different Islamic sects themselves (Gedimu vs early Sufi branches, Khafiya Sufi vs Jahriya sufi, etc.). Thus the Idea that Hui martial arts would be some �Muslim martial Arts� intended to protect all Chinese Muslims against non-Muslims people has absolutely no historical basis. These martial arts can be called familial, clan or even ethnic martial arts, but not religious ones � The Hui used them to fight indistinctively against Muslim or non-Muslim enemies, in order to protect local communities of Muslims and their non-Muslim allies. Thank you for your input. We are always pleased when readers and customers contribute to the conversation, especially if they have further knowledge. This article was written quite a while ago, and since then, happily, academics are starting to study these groups more openly and to a greater depth. As a matter of fact, the question of the blending of religion into all Chinese martial arts�Muslim-based or otherwise� is receiving some valuable inquiry. This probably does not need to be said, but it is neither our intention nor our way, at Plum, to downgrade or deny the diversity�quotidian and aspirational�of Muslim culture. I think we are pretty clear about this in all cases, but it never hurts to say this, especially in these times.